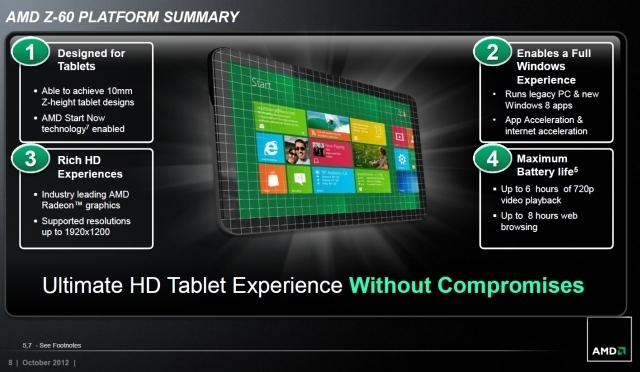 The AMD Z-60 (codename Hondo) is a x86 dual core processor for tablet PCs. It offers a relatively powerful integrated graphics card and a single channel DDR3(L)-1066 memory controller. Compared to the similar AMD C-50 and Z-01, the Z-60 featues a lower TDP rating of 4.5 W versus 9 / 5.9 Watt. Inside the Z-60 two Bobcat cores can access 512KB level 2 cache per core. In comparison to the Atom processors, the Bobcat architecture uses an "out-of-order" execution and is therefore faster at the same clock speed. However, the performance is far worse than similar clocked Penryn (Celeron) or Danube (Athlon II) cores. The integrated Radeon HD 6250 graphics card offers 80 shaders running at 276 MHz and an UVD3 video processor. Compared to the slow GMA 3150 in the Atom processors, the HD6250 offers a lot more performance and is about as fast as the Nvidia ION graphics solution. The processor speed is somewhere between a single core 1.6 GHz Atom N455 and a dual core Atom N550 depending on the benchmark (see C-50 page). Therefore, the performance is still in netbook regions and only suited for low demanding tasks. The power consumption is rated with a TDP of 4.5 Watt by AMD and in their reference system the Z-60 with 2 GB DDR3-1066 RAM reached 8 hours runtime with a 30 Wh battery. However, the Atom Z2760 and Atom N2600 still offer lower TDPs.